Everyone has various types of cells. 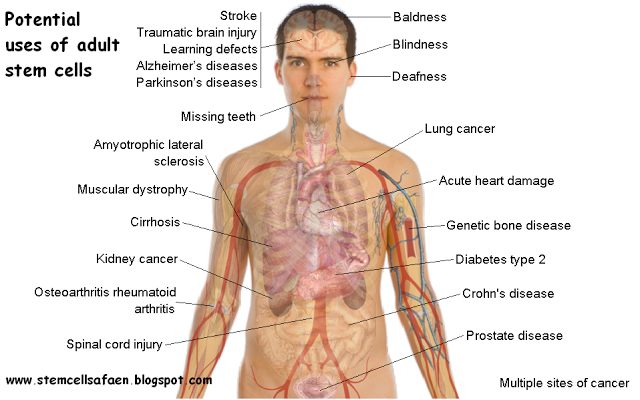 Liver, Pancreas, skin, blood, brain, you name it, and they are all there in the body. Each cell has a particular function and it is the collective function that keeps the body alive and ... well ... functioning. A stem cell is a sort of basic cell that has not yet been converted into one of the various types of cells the body uses to survive. They are what one calls primitive and remain so until they receive a chemical signal to change into a particular type of cell. There has been some controversy about stem cells, mostly brought about by ignorance of the fact that there are actually two types of stem cells. The first type is embryonic cells that have been extracted from the blastula1. These are the stem cells in which controversy over the moral and ethical issues of using embryonic stem cells surrounds. They are called Embryonic Stem Cells (ESC). They are said to be pluripotent2. and are very short lived as only exist in the early embryo and change into the various cells the body needs as part of the growth cycle. There have been many studies of ESCs over the years but it is only since around 1998 that human ESC have been successfully grown in vitro. As ESC can become almost any cell type in the body a number of questions then arose about how this could improve the health of a person. Would it be possible to grow organs in vitro for the purposes of transplant? Would it be possible to manipulate the genetic material of embryonic stem cells to repair sick and ailing cells and organs in the body? These questions have been clouded over by the moral and ethical considerations mainly because such stem cells must, by their very nature, be sourced from human embryos. In fact a major important legislation in the US relating to stem cell research known as the Dickey-Wicker amendment, first became law in 1996, and has been renewed by Congress every year since. It specifically bans the use of tax dollars to create human embryos - a practice that is routine in private fertility clinics - or for research in which embryos are destroyed, discarded or knowingly subjected to risk of injury. Despite this, private clinics continue to use ESC amid the controversy that surrounds it. 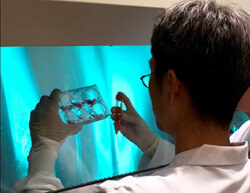 The other types of stem cells are called Adult Stem Cells (ASC). These are quite different and are, thankfully, inherent in every person's body. Until recently, less work in the scientific arena had been done on Adult Stem Cells as they were assumed to be 'lesser' stem cells with little therapeutic value. Strange as they are not subject to moral or ethics considerations, readily available and do not require extraction to be therapeutically effective. Possibly another issue is that it is difficult to grow and maintain ASC in vitro and there is therefore no commercial advantage available and revenues for drug companies producing drug related ASC is not considered viable. However, according to Christian Drapeau MSc, "The potential of ASC has been clearly revealed over the past five years thanks to the work of numerous scientific teams throughout the world. A large body of scientific data indicates that ASC have capabilities compared to ESC when studied in a living organism as opposed to a test tube. For example an ASC exposed to brain tissue will rapidly become a neuron or a glial cell, when exposed to liver tissue ASC will rapidly become liver cells3 and hair follicle stem cells can regenerate a sectioned spinal cord. In short ASC can virtually become every cell type of the body ..."
There are two types of bone marrow. Red bone marrow, also called medulla ossium rubra and yellow bone marrow or medulla ossium flava which mainly consists of fat cells. The red blood cells, platelets and most of the white blood cells as well as ASC originate from the red marrow. At birth, all bone marrow is red. As the body ages more and more of the red marrow converts to yellow, reducing the amount of red bone marrow available to the body and can then usually only be found in the ribs, vertebrae, pelvic bones and skull. Hence the amount of ASC exported from the red bone marrow reduces with age and the rate of healing of the body slows up. Until recently it was thought that adult stem cells could only replace various types of blood cells but further research has shows that ASC can replace any cells in the body if called upon to do so. If you scratch your skin or suffer a burn, or broken bone etc, it is now apparently how the body repairs itself. When young there are plenty of ASC to quickly rally around and replace the injured cells. As one gets older there are less ASC to go around and so the body takes longer to heal itself. But how does this process work? After tissue damage has occurred, the affected tissue issues a chemical compound called Granulocyte Colony-Stimulating Factor (G-CSF). G-CSF is a well known chemical designed to trigger stem cell release from the bone marrow.4 G-CSF is often used prior to some cancer treatments involving chemotherapy or radiation therapy since such treatments are known to kill all stem cells in the body. In this instance G-CSF is injected into the patient to trigger the release of ASDC which is then extracted and cryo-preserved. After the therapy is completed the ASC extracted is then replaced in the body bone marrow to continue its job. After tissue damage it is the G-CSF which initiates the release of ADC into the blood stream and on to replace the damaged tissues and cells. Increasing the number of ADC in the blood stream means there are more available stem cells available to migrate to the affected area or organ. Then the affected tissue releases a unique compound called Stromal-Derived Factor-1 (SDF-1).5 This is the only compound known to attract stem cells. Christian Drapeau MSc states, "This process has now been established and stem cells have been shown to participate in the repair of muscles, bone, pancreas, brain, skin, liver, intestine, lung ... virtually every organ and tissue of the body!" The number of stem cells circulating in the blood stream seems to be the important factor so the more stem cells one can encourage into the blood stream the faster the healing process will occur. As the body ages and more organs and cells start to break down, anything that can naturally assist in promoting stem cells entering the blood stream and be available for tissue and cell repair is recommended. However it was not known until recently why this botanical substance assisted so much and so well. It was found that AFA contains a compound called L-selectin ligand which supports stem cell release from the bone marrow. L-selectin plays a critical role in maintaining stem cells in the bone marrow and blocking it increases the probability of stem cells being released into the body. As a result a team of scientists have developed a proprietary concentrate of AFA that concentrates the L-selectin ligand so that it can be taken orally twice a day to promote the increase of adult stem cells by around 25-30%, adding approx 2-4 million stem cells to the bloodstream. This supports the natural renewal system within the normal physiological range without adversely affecting the body. Indeed results can usually be seen within several months of this regime of application. It should be noted that this type of therapy is natural as distinct from the invasive type of medical procedures required drugs, anaesthetics etc usually used. Stem cell therapy therefore is now available to anyone. Although it is likely not particularly needed for the young unless there is evidence of tissue damage beyond the natural capability of the body to self renew or repair, it is certainly a useful addition for the older person to balance the reduction of red bone marrow and subsequent natural production of stem cells. The fact that a nutritional supplement is available to enhance stem cell production should give new hope to those suffering tissue and organ damage. Blastula: from the new Latin meaning bud or stem. In embryology the early development stage of an animal consisting of a single spherical layer of cells enclosing a hollow central cavity. Pluripotent: meaning they are capable of differentiating into different types of body cell. Jang YY, Collector MI, Baylin SB, Diehl AM, and Sharkis SJ (2004) Hematopoietic stem cells convert into liver cells within days without fusion. Nature Cell Biol. 6(6):532-529. Leone AM, Rutella S, Bonanno G, Contemi AM, de Ritis DG, Giannico MB, Rebuzzi AG, Leone G, Crea F. (2006) Endogenous G-CSF and CD34+cell mobilization after acute myocardial infarction. Int J Cardiol. 111(2):202-8. Abbott JD, Huang Y, Liu D, Hickey R, Krause DS, Giordano FJ, (2004) Stromal cell-derived factor-1alpha plays a critical role in stem cell recruitment to the heart after myocardial infraction but is not sufficient to induce homing in the absence of in jury. Circulation 110(21):3300-5. Pugh N and Pascoe DS. (2001) Charecterization of human monocyte activation by a water soluble preparation of Aphanizomenon flos-aquae. Phytomedicine 8(6):445-53. Cottler-Fox MH, Lapidot T, Petit I, Kollet O, DiPersio JF, Link D, Devine S (2003) Stem cell mobilization. Hematology Am Soc Hematol Educ Program. 419-437. "A double blind crossover placebo controlled study, consumption of one gram of an AFA extract concentrating the L-selectin ligand led to an increase of an average of 25-30% in the number of circulating stem cells, providing for an increase of 2-4 million new stem cells in the blood stream. This increase peaked around 60 minutes after consumption and lasted 3-4 hours." Christian Drapeau MSc.